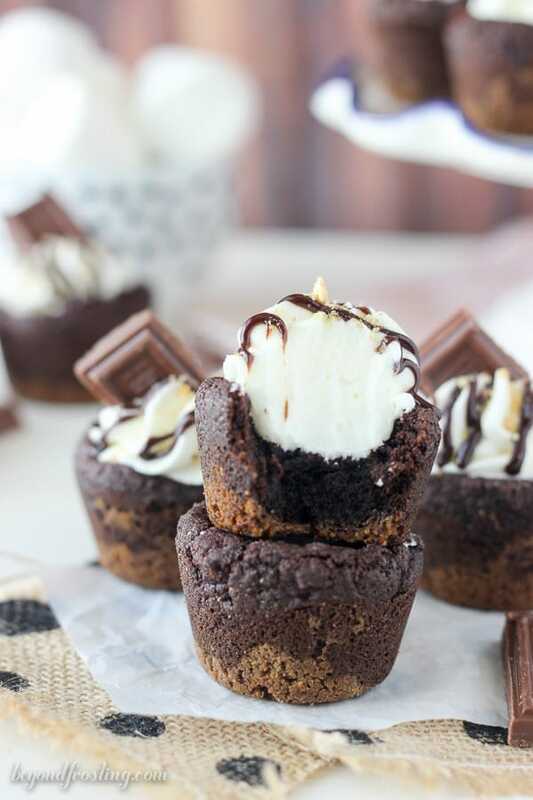 These S’mores Cream Pie Cookie Cups have an Oreo cookie crust with a soft chocolate pudding cookie, filled with a marshmallow mousse and topped with chocolate. Happy National S’mores Day!!! Can we all agree that this is one of the BEST food holidays ever? 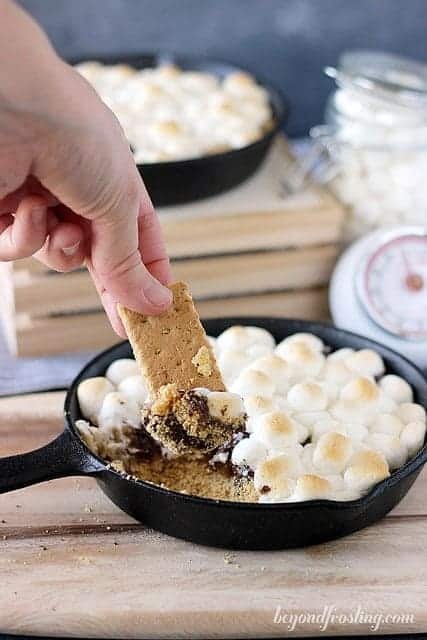 If you don’t like s’mores, I am not sure we can be friends. Kidding, kinda of. 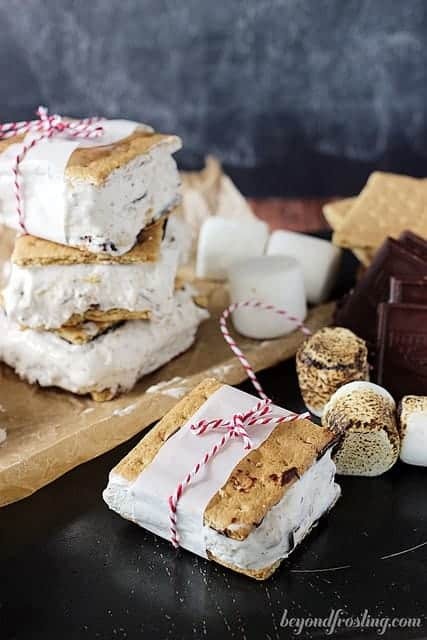 There is nothing better than a gooey s’mores by the campfire, but let’s be real here. How often are you hanging out by a camp fire? For me it’s once maybe twice a year. So I have to figure out a way to enjoy s’mores for the other 11 months of the year. 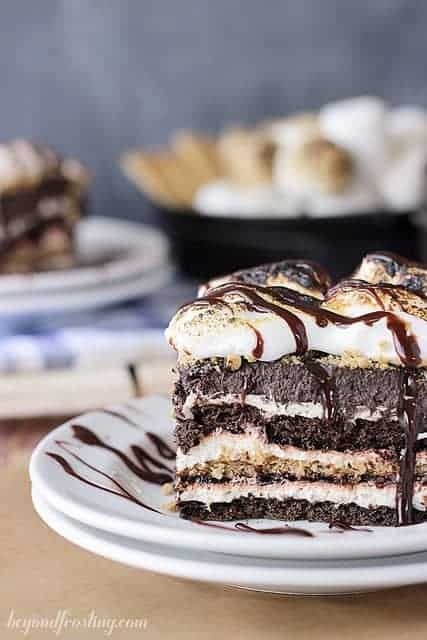 Thankfully I have you covered with some of my favorites like my S’mores Lasagna or my Bourbon Bacon S’mores Cookies. Last summer, I even threw a S’more Fondue Party at our annual summer trip to the lake! 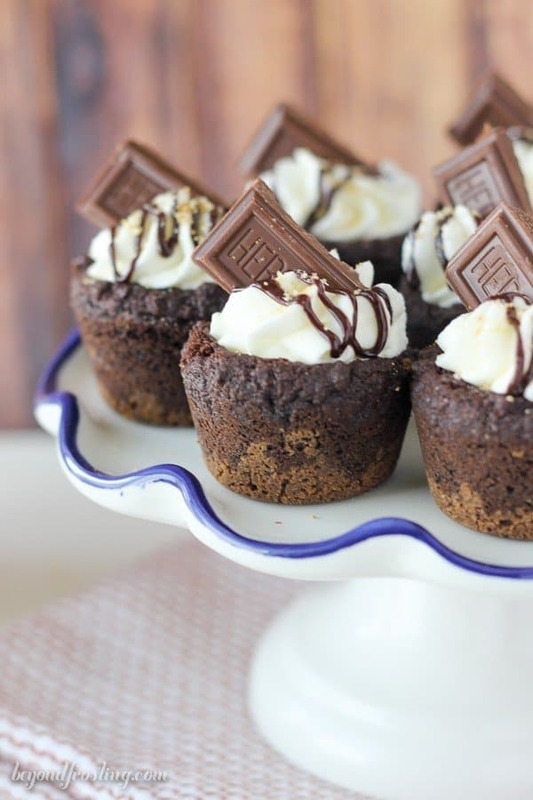 Today we’re going to talk about these S’mores Cream Pie Cookie Cups. It’s been so long since I shared a cream pie cookie cups. If you aren’t familiar these are cookie cups with a crust and a mousse filling then topped with whipped cream. Instead of a traditional graham cracker crust, I decided to use S’mores Oreos, but I am not totally in love with the color. It’s okay though because I do love the taste of the Oreo crust. Generally speaking I like the crust to contrast the cookie, hence using graham cracker crust. So you could go either way here, it’s up to you. I happened to have the S’mores Oreos in my pantry and this was the perfect excuse to use them! The Oreo crust requires less butter than a graham cracker crust, so you will need to add additional butter if you want a graham cracker crust. Just add one tablespoons at a time until the crumbs are wet enough that when you press it together, it holds it’s shape. The cookie is my dark chocolate pudding cookie, which stays nice and soft even after spending some time in the refrigerator. I do slightly under bake them which helps keep them soft. I prefer to use Hershey’s dark chocolate pudding but sometimes it can be difficult to find, so feel free to substitute with a regular chocolate pudding. When it comes time to add the filling, that’s where the real party starts. It’s a light and airy marshmallow mousse. Some people might describe this filling as dreamy, and I definitely have to agree with them. To finish these offer, sprinkles on some leftover Oreo crumbs, drizzle with chocolate sauce and stick a piece of chocolate on top. The best thing about bite-sized desserts is that it’s okay to have more than one. I don’t make the rules, but I am happy to follow them. 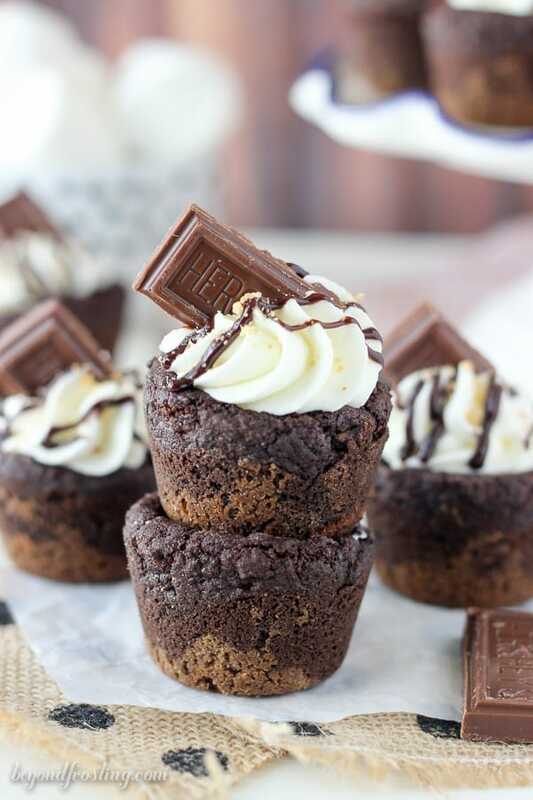 Celebrate National S’mores Day with these S’mores Cream Pie Cookie Cups. These cookies have an Oreo cookie crust with a soft chocolate pudding cookie, filled with a marshmallow mousse and topped with chocolate. Preheat the oven to 350° F. Grease a mini muffin pan with cookie spray or Crisco. Use a food processor to grind Oreos into a fine crumb. Melt butter in a microwave-safe bowl until melted. Combine melted butter with Oreo crumbs and stir until there are no dry crumbs lefts. Spoon 1 tablespoon of graham crackers into the bottom of the mini muffin pan and press down with a spoon or tart shaper. Allow the butter to come to room temperature for about 30 minutes. Combine butter and sugars in your stand mixer and beat on medium speed until light and fluffy. Next, add the eggs and vanilla extract and beat it into the butter and sugar until thoroughly mixed. Slowly add the dry ingredients into batter and beat on a low speed until dough starts to form. Drop 1-1.5 tablespoons of dough into the greased mini muffin pan on top of the graham crackers. Bake at 350°F for 12-15 minutes. For the filling: Put your mixing bowl and wire whisk in the freezer for 10 to 15 minutes until it is completely cold. Beat the heavy cream on medium-high speed for several minutes until it starts to thicken. Add the powdered sugar and continue beating until stiff peaks form. Set the whipped cream aside. Unwrap the cream cheese and microwave it on a plate for 15 seconds. In your mixing bowl, beat the cream cheese until it’s completely smooth and free of lumps, scrape down the bowl as needed. Add the marshmallow cream and beat until it’s well combined. Slowly fold the whipped cream into the cream cheese mixture until it’s well blended. Use a pipe bag fitted with a large star tip or a large Ziploc bag and fill it with the mousse filling. Pipe some filling into each of the cookie cups. The cookies must be refrigerated after you add the mousse filling. To garnish these cookies, melt the chocolate chips in the microwave and drizzle the melted chocolate over the mousse. If you have any leftover Oreo crumbs, sprinkle some crumbs over top. 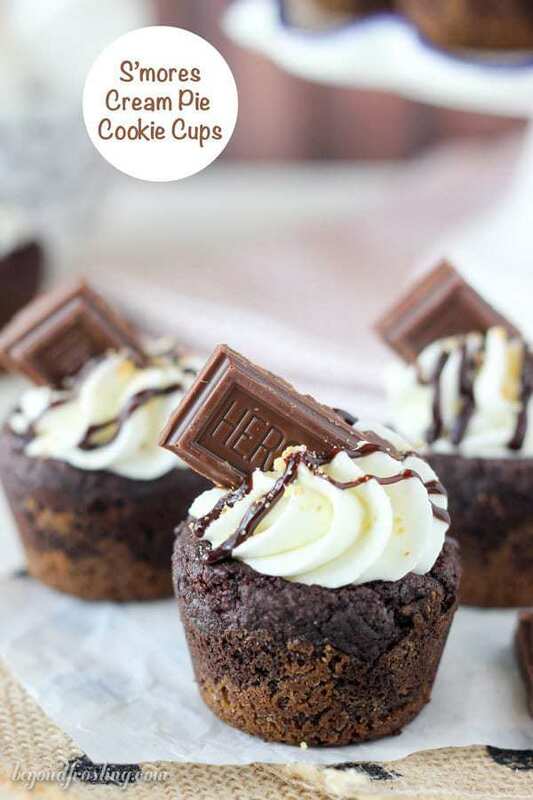 Stick a piece of chocolate into tops of the cookie cups. 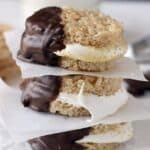 I love s’mores treats so much!! 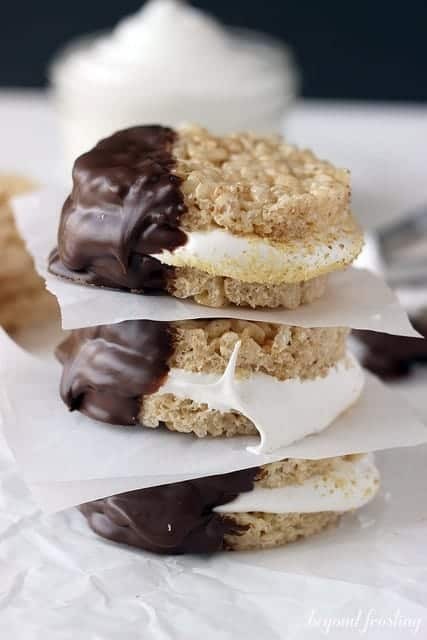 There is just something so good about that gooey chocolate and marshmallow together!!! 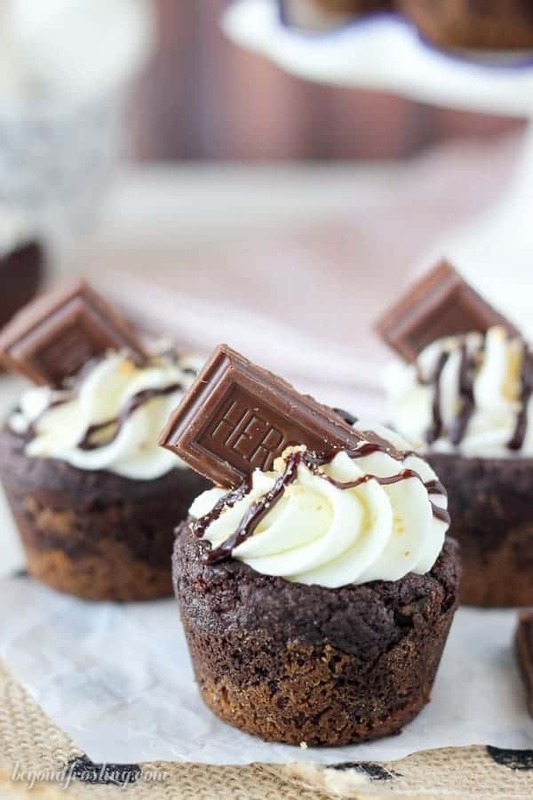 These delicious little cookie cups would not last long around me!! !